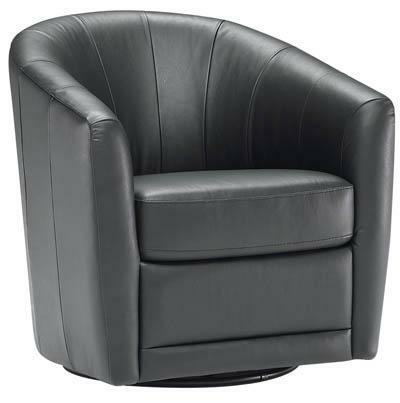 Create a contemporary atmosphere in your home with this sleek glider rocker barrel chair. Its curved barrel shape wraps around to provide cozy support while the boxed-edge seat cushion offers deep comfort. The base brings a clean look in addition to a soothing motion feature. The Giada Swivel Chair by Natuzzi Editions at HomeWorld Furniture in the Hawaii, Oahu, Hilo, Kona, Maui area. Product availability may vary. Contact us for the most current availability on this product. Fabric Content Leather, microfiber and fabric. Fabric Options Over 100 different covers and colors to choose from leather, microfiber, and superb fabrics. Frame Construction An engineered frame that is a combination of solid woods with plywood, OSB, particle board, a Masonite wrap, and a foam covering for protection. The types of designs produced benefit from this style because it is easily adaptable from classic to modern. Browse other items in the Giada collection from HomeWorld Furniture in the Hawaii, Oahu, Hilo, Kona, Maui area.